Clean, simple and versatile, 32inch Bedford Kitchen Cart seamlessly fits into any kitchen interior. Designed to cater to all aspects of the user's needs, storage, portability and additional workspace, this cart is sure to do wonders and bring spruce up your kitchen. Each natural wood top is hand-picked to show only the most beautiful and strongest grains for everlasting experience. Built with multiple types of storage, you can organise your essentials to maximise the efficiency of how your cart is used. This cart can cater to all types of interiors, from more neutral, traditional, to those more of contemporary styles, always adding to the beauty of your kitchen space. 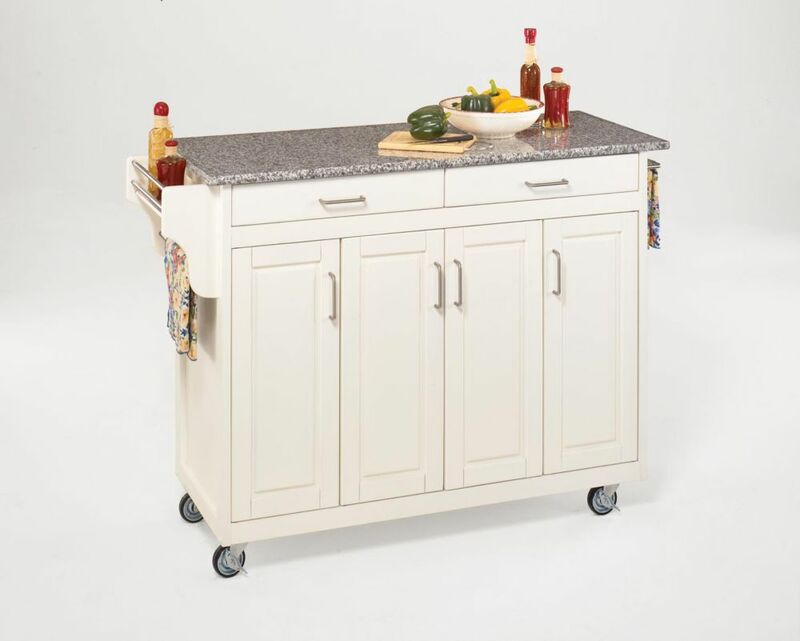 Create-a-Cart Kitchen Cart in White Finish with Granite Top is rated 4.4 out of 5 by 38. Rated 4 out of 5 by Fiesty75 from Received product in timely manner. Well worth the price. Good directions and well numbered for ... Received product in timely manner. Well worth the price. Good directions and well numbered for following directions. I am a 75 year old woman who read the recommendations before purchasing. Noted several that indicated a problem closing the drawers after assembly and hoped the problem was corrected. No such luck. One drawer closed, but not the other. After careful examination, discovered the slider units on each side of the one drawer not closing properly had been installed backwards at the manufaturers. Unscrewed the sliders. Switched sides and put the wheels to the back. Redrilled the holes to bring sliders closer to front edge and drawer now closes properly. This problem could be easily corrected at the plant. Highly recommend this be done asap. Built unit with only assistance needed in hoisting granite top to top. Pat myself on the back! Rated 4 out of 5 by Magnel from There were a lot of parts but it was not too difficult to assemble because they were well labelle... There were a lot of parts but it was not too difficult to assemble because they were well labelled. Couple of minor nicks on the item I received. The spice rack is a bit cramped under the worktop. Overall though I think it is great! I needed extra work space and cupboards that could be moved around in kitchen. Definitely fits the bill. Rated 5 out of 5 by 33541 from I love the Cart and it was easy to assemble. I love the Cart and it was easy to assemble. Rated 5 out of 5 by Msilva from Good quality Good quality and easy to assemble. Does need 2 people to put together. Rated 4 out of 5 by Mimi from This product is beautiful and very well made. As far as my assembly problems, I had a defective ... This product is beautiful and very well made. As far as my assembly problems, I had a defective drawer divider and one of the drawers could not be used because it was resting higher than the other drawer once I inserted it into the runners. Once I got my new drawer divider and a new drawer, it was perfect. As I mentioned, the materials are well made. I took the defective drawer apart many times thinking I was assembling it incorrectly, but that was not the case, and it held up very well. As far as the assembly instructions, they should indicate on the instructions that the front of the drawer should be in a certain position when assembling it because there is a difference in the amount of space on the top vs. bottom of the inside of the front of the drawer. If you assemble it with more space at the bottom, it will hit the bar beneath the drawers. Also, I didn't notice it soon enough, but all the pieces are labeled with small letters. Once I saw the letters, it was easier to identify all the parts and to make sure they were all there. I'm a 64 year old female and I put this together myself, with the exception of someone helping me lift the granite onto the top of the cart. Rated 5 out of 5 by Arlene from Easy to put together then I thought when I... Easy to put together then I thought when I opened box. Looks great!